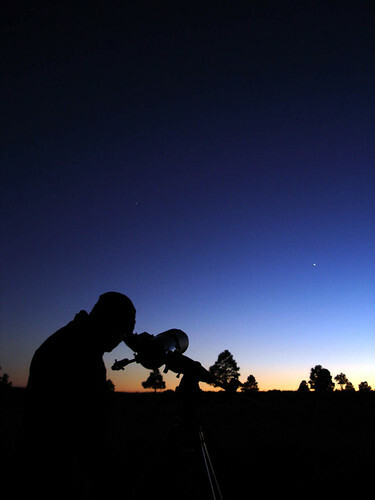 Backyard astronomy is a great way to get the whole family outside in God's creation. (cc image courtesy of makelessnoise via Flickr). We are all in need of a vision of God’s glory and we can learn to see it everywhere—even, like David, in the night sky. However, to most of us the night sky is a mystery. Just as with the daytime sky a little knowledge can go a long way when it comes to moving our hearts to wonder at God’s majesty. This guide will get you and your family on your way to becoming backyard astronomers with yet one more way to enjoy God’s creation! The earth is the third planet of eight (sorry Pluto) that orbit the sun and make up the solar system. The solar system occupies a remote spot in one of spiral arms of the Milky Way galaxy. A galaxy is a system of billions of stars and other matter held together by gravity. Our galaxy is called the Milky Way because that is what it looks like from our point of view—a faint band of milk spilled across the night sky. What we are seeing in that “band of milk” is the light from very distant stars in the rest of the galaxy. Which brings us to the question: What are stars? Stars are massive bodies of super-hot gas that radiate light and heat from fusion explosions in their core. Stars are born when bodies of gas become massive enough begin fusion of the basic elements that compose them, and they die when they run out of elements to fuel the fusion. An image from the Hubble Telescope of distant galaxies invisible to the naked eye. There are hundreds of billions of galaxies in the universe, each with hundreds of billions of stars. The Hubble Telescope has given us incredible views of deep space like the one on the right where every bit of light you see is its own galaxy! For millennia humankind has looked up at the stars, made shapes out of them, and then made stories out of the shapes. We call these shapes constellations and knowing them can make viewing the night sky a lot more interesting. The first thing you need to know is that because the earth orbits around the sun once a year we see different constellations in each of the four seasons. If you stay up late enough you can see the constellations of other seasons, but each season is associated with one constellation that is easy to find directly overhead around bedtime. The Summer Triangle: The Summer Triangle is easy to spot—it is made up of three bright stars in a large triangle shape in the middle of the summer sky. The stars are Vega (part of the constellation Lyra), Deneb (part of the constellation Cygnus the Swan), and Altair (part of the constellation Aquila the Eagle). You will know you are looking at the right constellation if you see a large cross shape extending into the center of the triangle—that is Cygnus. 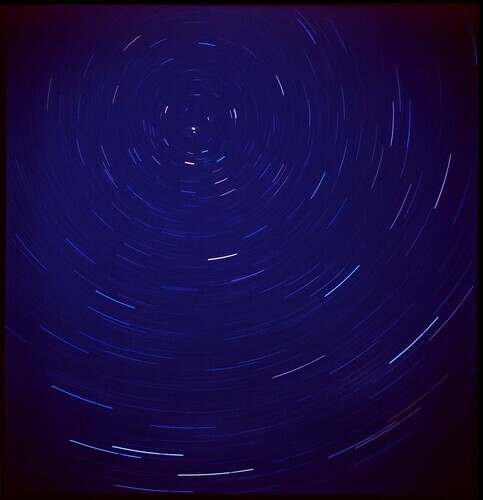 A time-lapse photo of the northern sky. (cc image courtesy of diata via Flickr). Pegasus: The Autumn sky is dominated by a series of constellations around Pegasus. The easiest way to find Pegasus is to look for the group of stars that looks like it is nearly a perfect square—that is the body of the horse, Pegasus. If you see a faint smudge nearby you’ll know you are in the right neighborhood—that is the Andromeda Galaxy, which is the nearest spiral galaxy to our own. Orion: It is hard to miss Orion in the northern hemisphere in winter. The constellation is identifiable by the chain of three stars that make up his belt. Orion is vaguely shaped like a person, with two stars above the belt for shoulders and two below for legs. If you look just below his belt you can see a diffuse, faint spot that looks like a galaxy; that’s the Orion Nebula. A nebula is a giant cloud of gas in which stars are born—this one is so large it takes a ray of light 24 years to cross. Leo: You can find Leo in the spring sky by looking for the backward question mark-like shape (the lion’s mane) in front of a short triangle (the lion’s body). You can always see the Big and Little Dippers in the northern sky. Their names give away their shape—they both look like giant soup spoons. If you trace a line from the end of the “spoon” of the Big Dipper the first bright star you see is the North Star—which is also the bottom of the handle of the Little Dipper. You don’t need anything to turn any night of the year into a fun family event outdoors—but a pair of binoculars don’t hurt. Here are a few ideas for exploring the night sky as a family. Scavenger Hunt: Make a list (start with the constellations mentioned in this guide) of things to find in the night sky. Write down constellations, planets, individual stars, and galaxies. See who can find the most or work together to find them all. Keep track of anything you find but can’t identify and then do some research on your own. Read the Myths: Learn the names of the constellations and read the myths people have made up to go along with them. It’s a great way to fill the night sky with stories and to talk about history with your kids. Knowing the stories behind the constellations also makes it easier to remember them. Keep a Chart: When ancient astronomers did their work they simply watched the sky and kept careful records. You can do exactly what they did and to learn about the universe. Keep track of the movements of the planets against the background stars and make drawings of the phases of the moon yourself! Enjoy “looking to the heavens” and tell us how it goes on our Facebook page.